One of the only shows I watch on FoodTV these days is The Kitchen, with Marcela Valladolid, Sunny Anderson, Katie Lee, Jeff Mauro, and the one and only Geoffrey Zakarian. The crowd has great chemistry together, each person bringing something different and fun to the show. Zakarian offers that touch of class and knowledge, sophisticated without ever being obnoxious, a tricky line to negotiate. 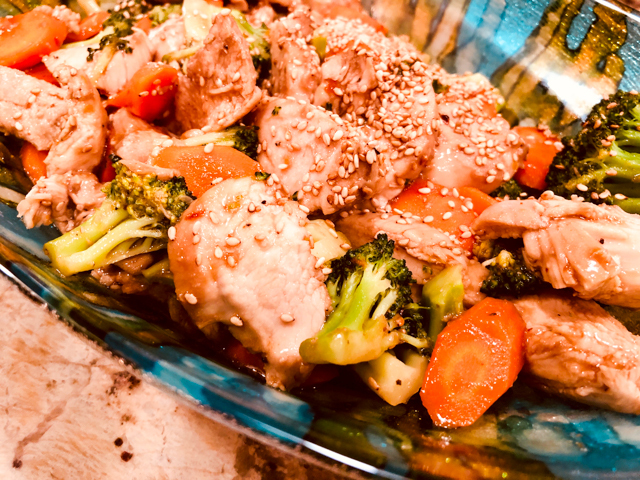 Recently he shared a recipe with his characteristic signature: elegant, complex, but not overly fussy. 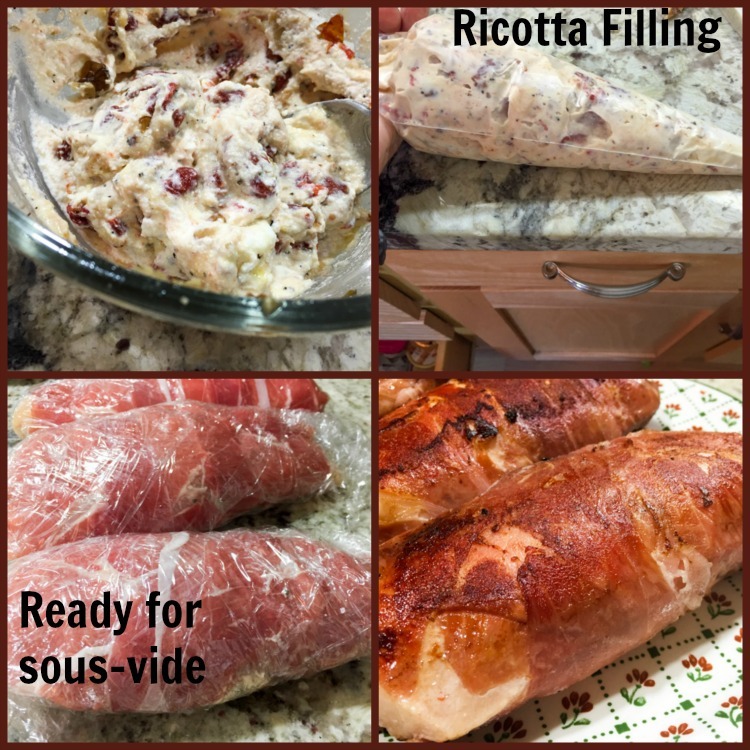 Chicken breasts filled with ricotta, wrapped in prosciutto, crisped up on the stove top and finished in the oven. A quick pan sauce beautifully crowned the dish, bringing capers to the party. 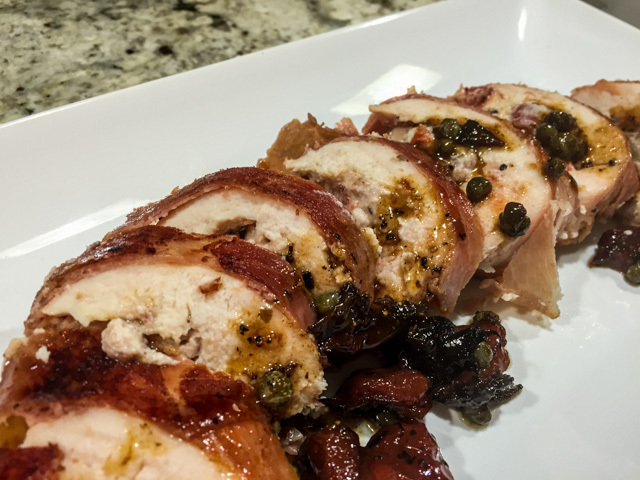 I have a weak spot for capers, in case you did not notice yet… As I watched him prepare the recipe, I could not stop thinking that the whole thing would be perfect for sous-vide. And sous-vide was the path I took. It was O.M.G. delicious. With the most enthusiastic happy dance to go with it. Of course, if you don’t have the Anova gadget, don’t let that stop you. I give you the exact method used by Zakarian in the show. However, I tell you, the texture of the meat cooked at that magical 141 F for hours… was superb. Superb! 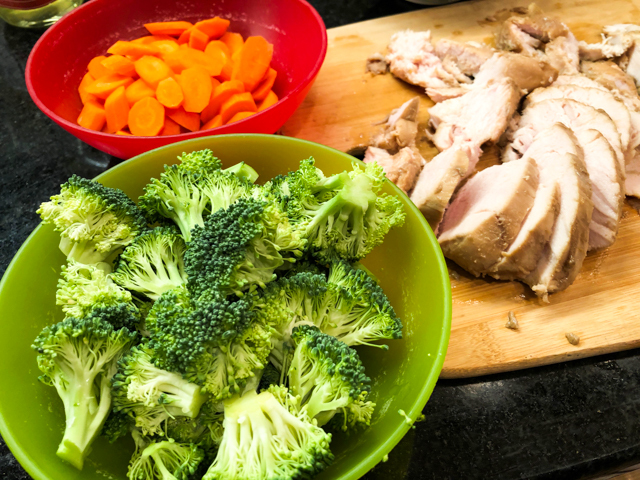 If using regular cooking, heat the oven to 375 degrees F.
Using a small knife, make an incision in the top rounded end of a chicken breast, cutting through the center and to the ends without breaking the sides, to form a pocket for the stuffing. Combine 1/2 cup of the tomatoes, ricotta, walnuts, sage and egg yolk in a small bowl and season with salt and pepper. Using a spoon (or place the filling into a piping bag without a tip), stuff each chicken breast with 1/3 of the ricotta mixture. Season the chicken with salt and pepper, then lay the prosciutto into sheets of three pieces each, and roll around each stuffed breast. Heat the canola oil in a large, ovenproof saute pan until almost smoking. Sear the chicken breasts on the seam side of the prosciutto, then flip and sear the other side.Transfer the whole pan to the hot oven until the center of the chicken registers 160 degrees F, about 15 minutes. If using sous-vide method: wrap each piece in plastic, then seal in a foodsaver type bag. Submerge in a water bath set to 141 F for 4 hours. When the time is up, remove the meat from the package, dry well and proceed to browning both sides on the stove top. For both types of cooking, continue to make a pan sauce: remove the chicken from the pan, add 1/2 cup of the sun-dried tomatoes, capers and shallots and cook over medium-high heat for 1 minute to soften the shallots. Add the Verjus to deglaze the pan, the chicken stock and cook until reduced by half, then swirl in the butter. Adjust seasoning with salt and pepper. Comments: I had a bit of a tough time filling the chicken. First I tried it as recommended, without a tip in the piping bag, but my bag was too thin, not sturdy enough to force the filling in. I tried with a tip, but the largest one I had was not wide enough and kept plugging with the pieces of walnuts. Since I was going to wrap the pieces with plastic anyway, I ended up cutting a slit around the side, opening the meat like a book, then rolling the prosciutto around. During the sous-vide cooking, it all turned into a perfectly shaped package. If you have a sturdy piping bag, it should work well. About that Verjus: If you don’t have it, use white wine or simply chicken stock. 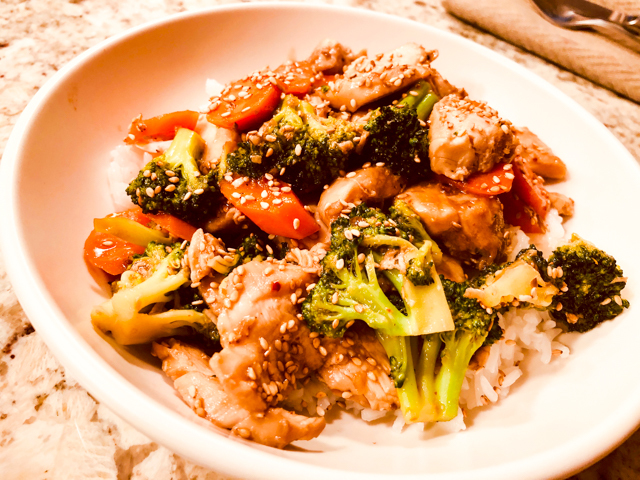 I am getting more and more fond of its subtle flavor, the way it brings mild acidity to a sauce or dressing. And, by the way, did you know that a little Verjus mixed with carbonated water is a fantastic drink? Elaine tried it first and raved about it. Some people add sweetener, but we both like it straight. I am very fond of carbonated water with drops of bitters such as Angostura, so I’m not surprised that Verjus pleased me so much.